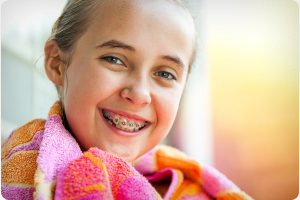 1.Your Kirkwood, MO, orthodontist approved metal braces are fully customizable! That’s right, you have many options these days! You are not restricted to traditional old gray and metal in your mouth, and your Kirkwood orthodontics office will be happy to help you figure out your options. One possibility is gold braces, which offer a more muted, softer and warmer appearance than traditional metal braces. The gold blends better with the natural color of your teeth to create a more elegant and sophisticated appearance. You can also opt for designer brackets in the shapes of hearts, flowers, stars, footballs, diamonds or a “Mickey” like you might see at Disney World. In most cases, these are only placed on the center upper front teeth, since those are the teeth that show the most when you smile. This helps keep overall costs down. Want a little color? Want to make a statement? You can also customize the colors of the elastic bands on your brackets. Since they are replaced regularly during scheduled maintenance visits, you can also change your colors as often as you wish. You can complement a color of clothing you often wear, coordinate with holidays (using colors appropriate for Christmas, Halloween, or Easter, for instance), or even your moods! 2. Your Kirkwood orthodontist attaches brackets to teeth with a special substance that releases fluoride. Fluoride helps prevent tooth decay and promotes healthy bone growth! 3. Wires for braces are often made of Nitinol, a nickel-titanium combination originally developed by NASA for use in space travel. The wires are flexible and elastic and can keep their shape even after being bent to apply pressure to teeth. They are very versatile and can also be found in mechanical watch springs, some eyeglass frames, and self-bending spoons used by magicians. They might even be used in heat engines, toys, and medical devices! Your orthodontist in Kirkwood, MO, can happily tell you more. To find out more surprising facts about metal braces, call Borello Orthodontics in Kirkwood at 314.821.2400.